Anything Star Trek… but the new movies help and I hope they keep up the good work! All My Children/One Life to Live … but who has time to watch soaps anymore? If they touch General Hospital I will riot. Alphas… I want to know what happened at the train station when Gary woke up! Trading Spaces … just cause I still dream about being on that show. If you want to know more about Mama Kat’s Famous Writing Workshop, click on that trophy over there and join! 2.) Write about something that creeped you out. 3.) List 6 retired tv shows you’d like to see come back. 4.) What’s cooking in your slow cooker? 5.) Show us your pumpkin patch. 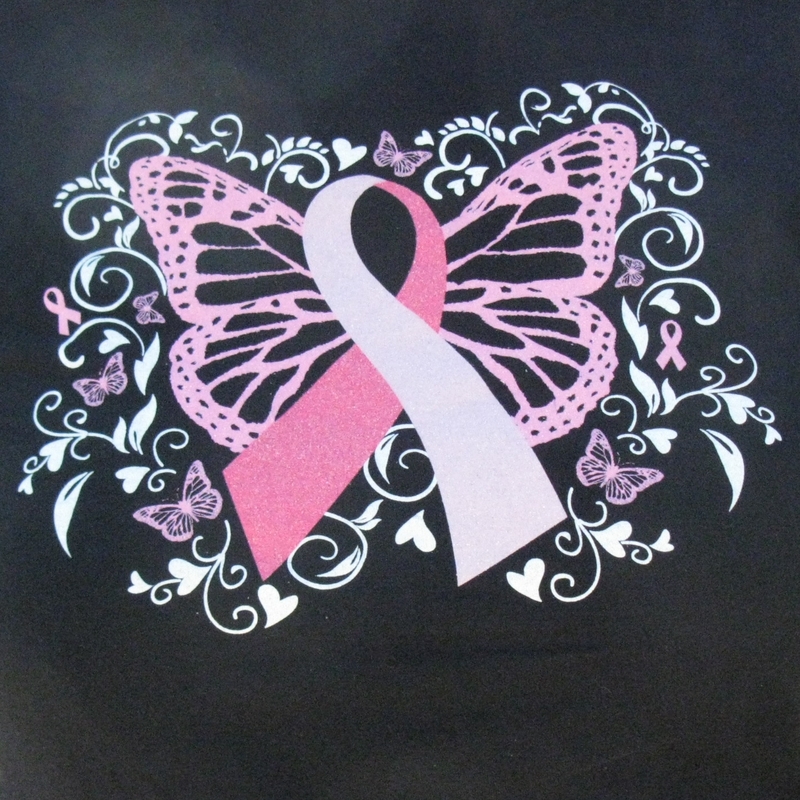 This is the shirt I bought at Wal-Mart to wear on the days my mom has chemo. A portion of the proceeds went to the National Breast Cancer Research Foundation. Once again, Team E.o.t.T joined together to Make Strides Against Breast Cancer in honor of my mother, my aunt and their cousin–all survivors. My daughters, my mother, MIL, future SIL, her mother, scout and church friends all got together this past Sunday for the 5K walk. The Chief and the husbands of two of our walkers all cheered at the finish line. The BIL walked this year with the mothers to help them along the hilly course. Thursday night my throat started hurting. I should have known… during my last sprint training runs (about 350 feet x 8) I said to my trainer, and I quote, “I feel like poo.” By Friday morning my tonsils were the size of golf balls. I good feat because I have enlarged tonsils to begin with. Everything ached. And yes, clinic doctor, I know when my body is running a low-grade fever even if my temp is hovering at 98. 😛 My quick strep was negative but given my suppressed immune system and the fact I had been subbing in the elementary schools I was given some antibiotics and lidocaine throat gargle and sent on my way. I spent the rest of Friday in bed, only getting up to go to the chiropractor for my pre-race adjustment. Oh man did it hurt, I mean really hurt, as he fixed my subluxations. See? Told you I had a fever. The Chief even took T1 to her first home coming football game in the rain. I’m bummed to have missed it even if it was raining. 😦 Saturday I was up and out on the soccer fields for back to back games in the drizzle with the throat still a little sore. I stayed low-key the rest of the day in the hopes of feeling better for Sunday but I did help T1 get ready for the dance and dropped her off at her friends. One of my teammates, much younger (by like 15 years), started the course well before I did and she ran and was the first finisher. If you remember last year, I was the 1 and only runner. I started the race more officially this year–actually hitting the stopwatch on my phone and running from the start–but about 5 minutes after her. I was the second to cross the finish line (about 12 minutes after her). When I hit stop on my phone I couldn’t believe it–a new Personal Best Record of 32 minutes, 37 seconds! I hadn’t even had a 33 minute time since a training run back before my 5K in May. I was totally stoked! Wow. Take that tonsillitis! Also, I didn’t get lost this year! Yeah for a better sense of direction … even though most of the participants missed the last turn (poorly marked). There were a couple of more runners this year, including my scout teammate. They had the stragglers take a few short cuts to have the event end at a reasonable time–my mother was one of the short-cutters, but hey, she’s allowed. 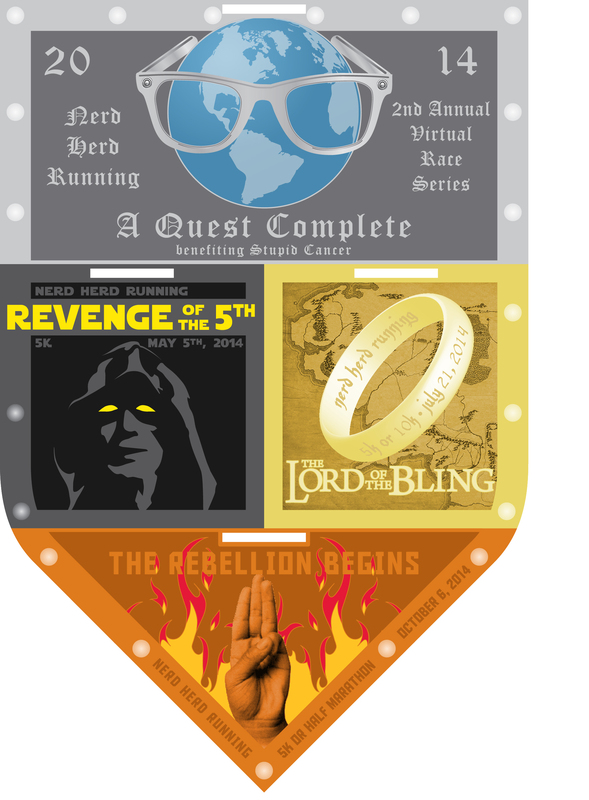 This race also marks my third and final 5K for the Nerd Herd 2014 Virtual Race Series. The participants run or walk races (all at once or cumulative) on their honor, send in their times, and receive really cool medals. Proceeds benefit Stupid Cancer. My first race was the Marine Corps Historic Half 5K, an on my own 1 + 2.1 the week I was at summer camp, and this 5K on Sunday. I really feel like I accomplished something(s) for a good cause and I’ve definitely improved (even if I haven’t lost a single pound). Next race and new goal: Arthritis Foundation Jingle Bell 5K Walk/Run in December and I will beat my time by 37 seconds. One week of rest and then 7 weeks of training. I’m expecting this to be the flattest course I’ve run so I’ve got a shot. Pssst! You can still make a donation for Team E.o.t.T. … just go to the Making Strides hyperlink above and search for Team E.o.t.T. … Come on, you know you want to congratulation me on my new PBR! You are currently browsing the snipewife blog archives for October, 2014.